Friday evening was full of activity at Berthoud High School. It was an evening of art and entertainment with something for everyone. Some of the students were also very busy with several appearing in more than one show. The gymnasium was the showcase for visual arts while both stages were in use for the music and dramatic arts. 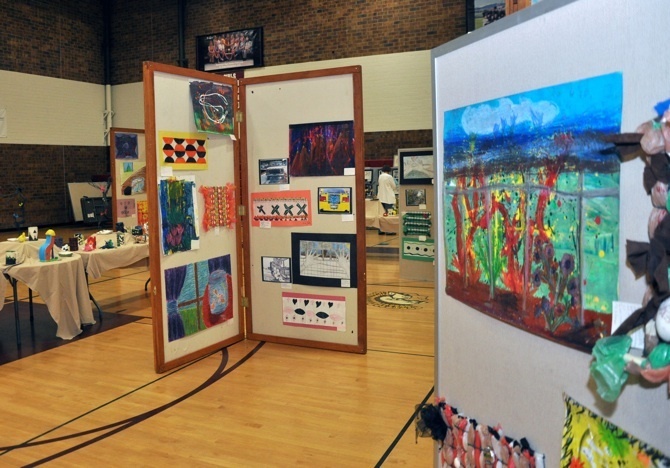 The visual arts included all types of two and three-dimensional exhibits covering the walls and floor of the gymnasium. 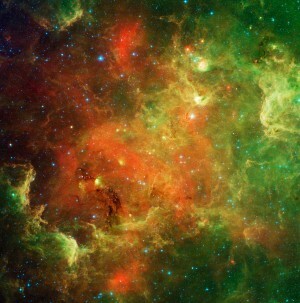 Note: Many of the photos can be viewed larger by clicking on the image. One could have spent hours here. While many of the objects are part of a group, some students have gone to the trouble of making up a display of their projects for the year. 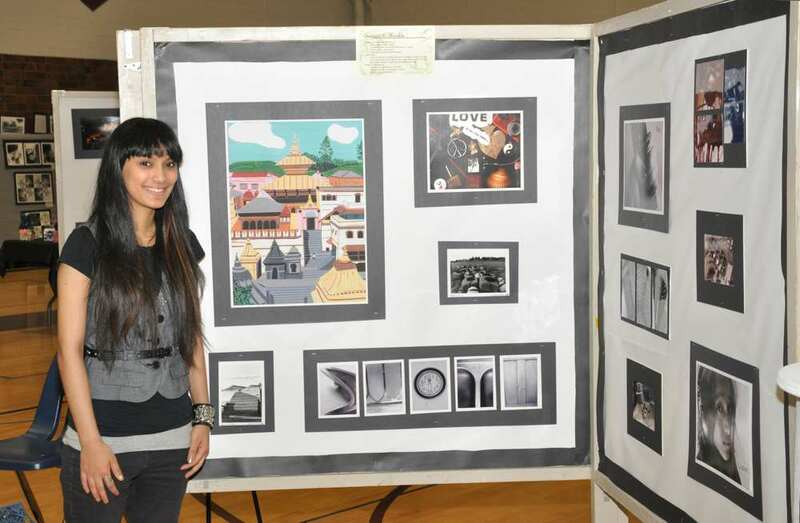 Two of the visual artists who participated and stayed with their displays were seniors Vick Clark and Saraswoti Shinkle. Both of these young women exhibited a wide range of photographic and graphic design talent. Clark intends to continue on graphic design as a career path while Saraswoti indicates that she wants to major in English and become a teacher. BHS Senior Vickie Clark stands in front of a display of her photographic and graphic design work. 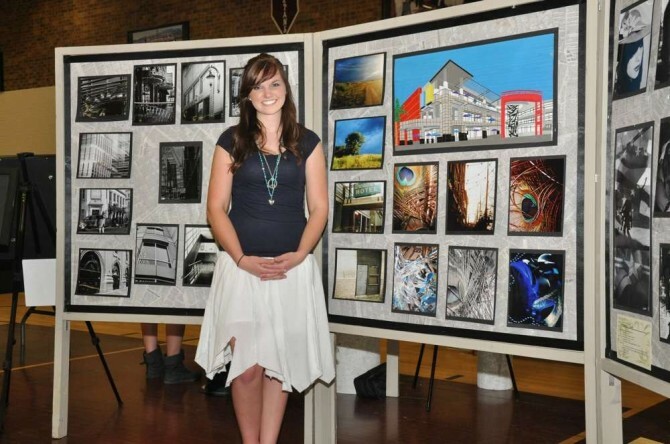 The architectural photos behind her depict buildings from various cities around the United States. Saraswoti Shikle explained how she made the collage in the upper right corner of the display panel by placing all the items on the scanner at one time. 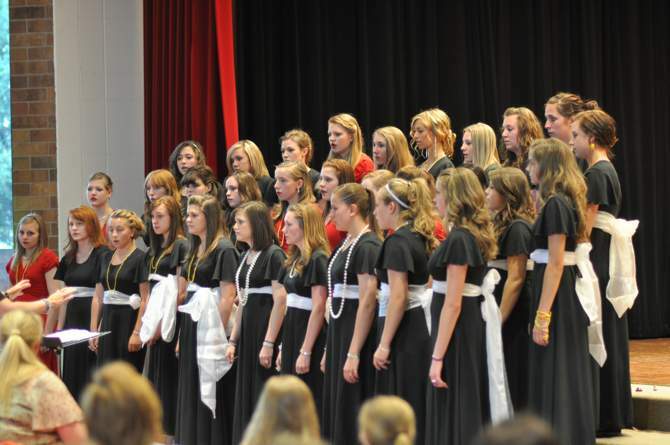 The Berthoud High School Choirs were the first performing arts as they took their place on the commons stage. The Bridge Between started the show with four numbers of their song and dance routines. The Bridge-Between was followed by the Mixed Choir who entertained with two literary pieces with text by renowned poets, “The Tiger,” text by William Blake and “The Road Not Taken,” text by Robert Frost. Their finishing numbers was “Going Over Home,” an arrangement based on two traditional spirituals. Syren’s Aria women’s choir kicked off with “Diamonds are a Girls Best Friend” and finished with “Crossing the Bar.” With Miss Jessalyn Neuhalfen conducting. 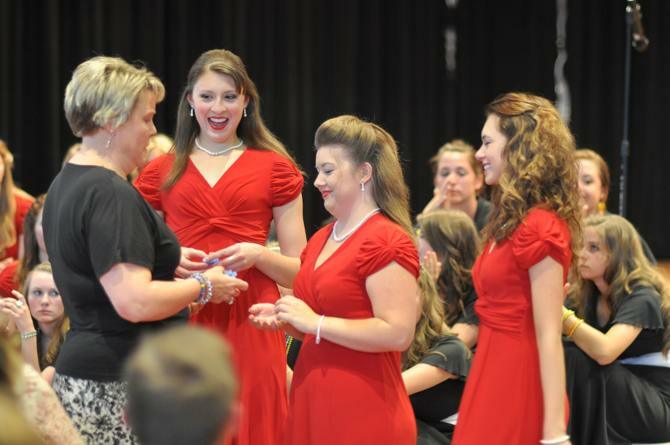 Choir Awards came next, with Choir Director Paula Latchaw awarding letters and pins for the many students who have participated in the choir. You will note the awards by their names in the lists published here. There were many emotional moments. Since Mrs. Latchaw also directs the Middle School Choir, some of the graduating seniors have been with her for seven years. After the awards, the combined choir sang “Season of Love.” A tribute to the seniors – Marie A. Allison, Bri Condon, Jesa Emerson, Michelle Hanford, Katie Kouns, Graham Lier, Amelia Rael and Amanda Walsh. 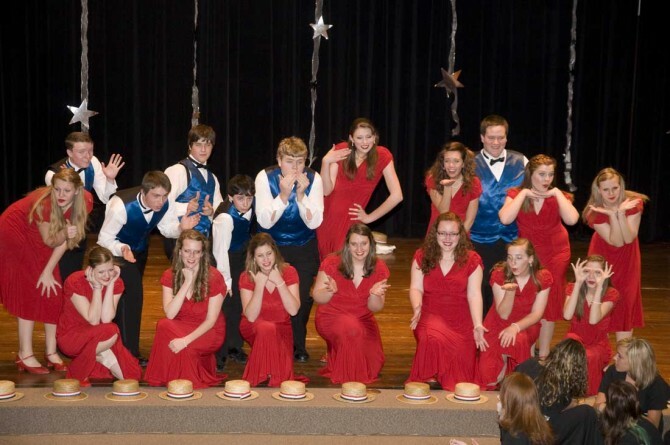 Soon after the choir presentation was over the band performed on the auditorium stage and the drama seniors presented one-act plays on the commons stage. 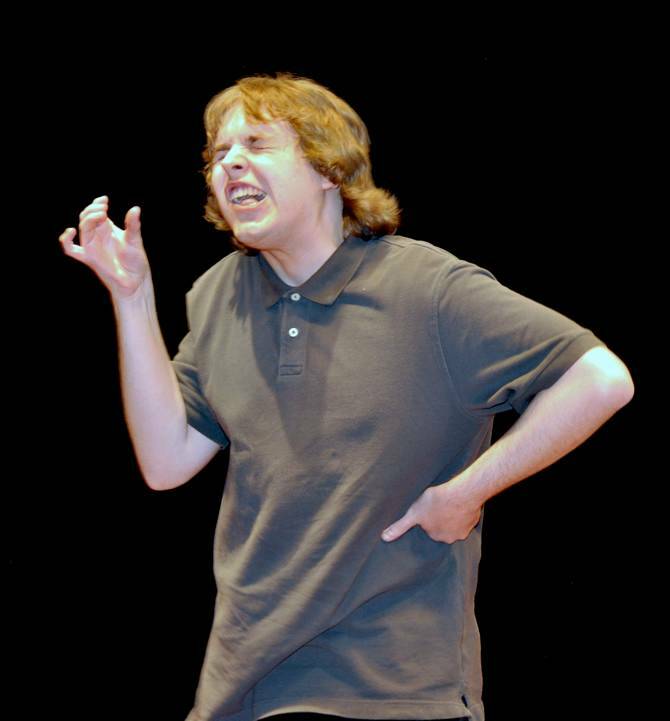 The Drama senior’s presented a series of one-act plays. Amelia Rael and Mary Wellems perform their one-act play. Also in this production was Kyle Wilcox who is not in the photo. The Drama Class was followed by the two members of the Forensics team. The forensics performances too are drama, but it is of a different sort, perhaps described as a recitation. They can be very dramatic presentations and two talented performers took the stage. 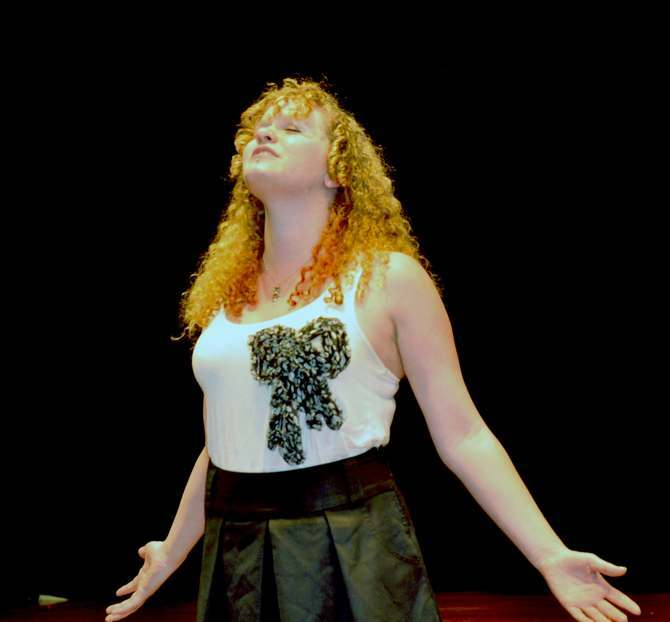 Jean Powers performed two pieces, Diver and Say Yes by Andrea Gibson. Jean Powers shows great emotion as she closes her dramatic presentation. Graham Leir closed out the performances on the commons stage with a Winnie-the-Pooh dramatic production. Lier plays three roles in this presentation, each with a different voce and posture. He moved effortlessly between characters. The students and teachers obviously worked hard to bring all this together. This is one of the premier evenings at the High School, if you missed it , plann to attend next year. Site contents copyright © 2019 Recorder Online	except as noted. All rights reserved. | 92 queries in 1.203 seconds.